Saudi Arabia is making a drive to become a regional hegemon. It has long used its oil wealth to achieve a great deal of influence among neighbors, of course. But it is now flexing military muscles. From a Saudi point of view, they have suffered decades of dangerous reversals, and they are determined to push back foes and ensure not just their security but their control. The dangers the Saudis see include the revolutionary, Shiite Islam of Khomeinist Iran. It is not only a hated rival branch of Islam but Ayatollah Ruhollah Khomeini, who came to power in 1979, said “there are no kings in Islam.” It is republican with a small ‘r.’ The Saudis hate it just as the Austro-Hungarian emperors hated the French Revolution. 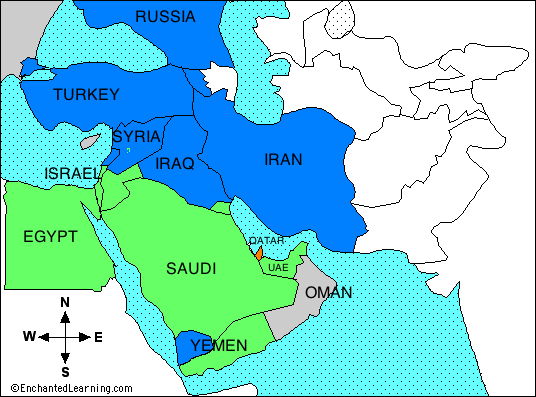 Inasmuch as Hizbullah in Lebanon adopted Khomeinism and is close to Tehran, it is also seen as a threat by the Saudis. The anti-Wahhabi, Zaydi Shiite Houthi movement in Yemen has made the error of imitating Hizbullah and speaking of overthrowing the House of Saud in Riyadh, and Saudi Arabia has gone to war against the Houthis in Yemen. The Syrian government of Bashar al-Assad, dominated by Alawite Shiites who are secular socialists, is seen as an enemy mostly because it is allied with Iran (the Saudis used to support the al-Assads back in the 1970s and 1980s). The Saudis have supported radical fundamentalist guerrillas in Syria such as Jaysh al-Islam. It so happens that along several dimensions, the groups the Saudis see as threats are the same as those tagged as dangerous by the right wing Likud Israeli government, creating a Saudi-Israeli tacit alliance. Hence the influence in the campaign against Qatar of American Israel lobbies. Riyadh feels that the Bush administration deprived them of an ally in the form of the Sunni Saddam Hussein, and replaced him with a pro-Iranian, Shiite dominated Iraq that they fear. On the Sunni Side, the Saudis are anxious about the populist Sunni movement, the Muslim Brotherhood. Saudi Arabia, a country of some 20 million citizens and 6 million guest workers, follows the ultra-conservative and puritanical Wahhabi form of Islam, which is rejected by all but 21 million or so Muslims in the world. Some Sunnis are attracted to a form of Sunnism inflected by Wahhabism, known as Salafism. The Saudi royal family does use appeals to Muslim arch-conservatism as a form of soft power. But it is also perfectly capable of supporting secular movements and governments. Thus, it backs the Egyptian officer corps, which is nationalist rather than fundamentalist. It favors the secular Palestine Liberation Organization over the fundamentalist Hamas. Think about the Wahhabis as sort of like Southern Baptists inasmuch as both are very literalist in their approach to scripture, protestant, puritanical, and reject the idea of saints’ intercession with God or gaudy decorations in place of worship, and both are highly patriarchal. The two are very different, but share some religious themes. Qatar is also a Wahhabi society, but it is a much smaller country (probably 300,000 Qatari citizens and a couple million guest workers, mainly from Asia). Because influential members of the Egyptian Muslim Brotherhood took refuge there in the 1950s and after, since the MB was and still is seen as dangerous subversives in nationalist Egypt. Think of the Muslim Brotherhood as sort of like a lay Catholic order that enters into politics, the sort of people active in the National Right to Life organization, who want to shape civil law in the light of their canon law. The MB for the most part did not reject saints or visiting their tombs for blessings. It is populist, a movement of the lower middle class (along with some business people and professionals) rather than being aristocratic and absolutist the way Wahhabism is. If authority in Saudi Arabia is a pyramid with the king at the top and the tribes and clergy and people at the bottom, authority in the Muslim Brotherhood is more like the spokes of a wheel going out in a more egalitarian way from the Supreme Guide and his politburo. The Saudis are afraid the wheel will pull down the pyramid. The Muslim Brotherhood is not a terrorist organization, and Qatar, contrary to what Trump alleged, is not supporting terrorism. In fact, the common conceit in the West that Wahhabism is linked to terrorism would be hard to prove. Lots of Sunnis and Shiites have committed terrorist acts, as have Catholics, Protestants, Buddhists and Hindus. Most Wahhabis go through life committing no violence. I even know relatively liberal Wahhabis who are more liberal than some Sunnis I know. The oil wealth has created a new generation of cosmopolitan Wahhabi young business people and professionals. There are still many strict puritans, of course, but puritanism, however annoying, is not terrorism. And let’s not forget that America was founded on puritanism. Qatar stands accused of using the Al Jazeera satellite t.v. station to promote the Muslim Brotherhood. (Religious Palestinians have long been important in its management and staffing). When the Muslim Brotherhood came to power in Egypt in 2011-2012, claiming Islamic authority based on its populism and elections, that posed a severe threat to the Saudi monarchy, which suddenly had a religious and not just secular rival in Egypt. The Saudi elite was afraid Brotherhood influence would come over and challenge the monarchy. Hamas in Gaza is a distant branch of the Muslim Brotherhood (it is organized by country, so there is no common reporting line). That is one reason the Saudis dislike it and back the secular PLO. Qatar, from Riyadh’s point of view, is just not a team player. It has supported the Muslim Brotherhood and kindred movements in Egypt and Syria. It is allied with the pro-Muslim Brotherhood Turkey. Qatar’s traditional policy is to keep lines open to Iran and to remain on speaking terms with the ayatollahs, while Saudi Arabia’s deputy crown prince Muhammad bin Salman wants to isolate Iran, cut off its government, and kill it. Qatar is on the exact opposite side from Iran in Syria, where it supported the Muslim Brotherhood rebels, some of whom morphed into radicals. But it doesn’t support the Salafis such as Jaysh al-Islam, who are backed by the Saudis. Both Qatar and Saudi Arabia have lost in Syria to the Iran-Russia coalition. But since Qatar has no ambitions to be a regional hegemon (it is too tiny for that), they can live with that defeat and still hope to be influential among the Syrian Muslim Brotherhood-linked groups in any post-war settlement. The Saudis are furious about their defeat and inability to dislodge Iran from Syria. The Saudis are on a war footing in their quest for hegemony, and so abhor grey areas. Everything is black and white to them, and Qatar is not following that logic. The Saudis and their allies have blockaded Qatar, which gets 90% of its food from places like Jordan, from which it is trucked in across Saudi Arabia. If it has to fly or ship in food, that will be an added expense for the guest workers, who could start peeling off. It isn’t clear exactly what the militant Saudi would-be hegemons want. Qatar has already expelled Hamas members from Doha. Does Riyadh insist on Qatar cutting off the Muslim Brotherhood everywhere? The closure of Al Jazeera or radical changes in its editorial line? Cutting off Iran diplomatically? The crisis will probably be resolved without such drastic measures. Qatar has the advantage of being the world’s biggest supplier of Liquefied Natural Gas, making it fabulously wealthy and independent. But it suffers from having a tiny citizen population, smaller than that of Cleveland. In military contests, demography is often destiny.